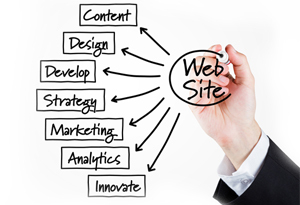 High-value, engaging website copywriting to capture your customer's attention. Blog and news article writing and distribution to gain authority in your industry. Business writing, white papers and brochures for powerful sales tools. People love to read fresh, timely and high-value content and, knowing this, search engines tend to give sites with professional content a boost as well. Content really is the "fuel" for all of your web marketing initiatives, but it has to be worthwhile and worth people's time and attention. Ideally, it should be good enough that they'll want to share it with their peers and colleagues rather than merely glancing at it and forgetting about it. As a business owner, you may have neither the time nor the inclination to write strong content for your website. Whether writing for your site, blog, press releases or corporate white papers, our US and Canada based team of English-speaking business and content writers are the best there is. We'll work with you directly to ensure that the style and tone of the writing corresponds with the professional persona that you want to perfectly represent your business. The way your website reads will make the difference between a visitor that stays engaged and one that leaves to find a more well suited company for their requirements. A visitor, whether consciously or not, will judge your site based on factors such as correct grammar and prose, while needing a connection or hook to feel like your company understands their needs. Not only should a website have well-written content and a regularly updated blog but these pages should also be optimized as part of your ongoing web marketing strategy. There are not many writers in the industry that specialize in both business writing and SEO techniques. Our writers strike the balance between words that receive authority and attention from prospective customers and the major search engines. As part of your ongoing "off-page"strategy you should have articles and press releases written and distributed on your company's behalf. Articles are the best way to provide informational, "how-to" advice that searchers find when they need a question answered. This is a proven strategy that will attract new customers, that would never have heard of your business otherwise, by proving your expertise in your chosen field. A press release is an announcement that can be published under your "news" section, in your blog, or can be submitted to popular news sources online. A press release can announce any change in your business from a featured product to a new website design. Press releases routinely appear in search engines and this is a great way to let your customers know that your business is always growing and improving its services and staying on the cusp of the industry. White Papers have become extremely popular for presenting to prospective customers online and in meetings. White Papers can be of a technical nature, or they can simply state why your product/service solves your customers problem and how your company does a better job of it than the competition. Think of white papers as a sales tool that breaks down your products/services in layman's terms. This is a great asset for a sales team, or to present to major decision makers, who have to explain what they want to purchase to their superiors. We also provide any other style of writing for business materials including brochures, flyers and newsletters. These marketing materials are guaranteed to make your sales seamless and easier than ever before. To help us better understand your content writing, content distribution and other web marketing requirements, contact us for a free, no-obligation consultation. We'll get to know your business and help you decide on the best strategy to achieve your objectives. Let's talk about your website! Search Engine Optimization - SEO / Search Engine Optimization or SEO as a web marketing strategy aims to get your website ranked at the top of search engines so that your clients will find you before they find your competitors. Social Media Marketing - Your clients, potential clients as well as your competitors are engaging with each other on social media networks, so don't get left out of the conversation. Please select the number FIVE below and then press the send button. ...Thanks for the gorgeous new website! It makes me smile every time I see it, and my leads have spiked since it launched..."